What can you win? A December Topbox! See details at the bottom of this post. What you see pictured is from the November Topbox, and that’s what I’ll be reviewing. 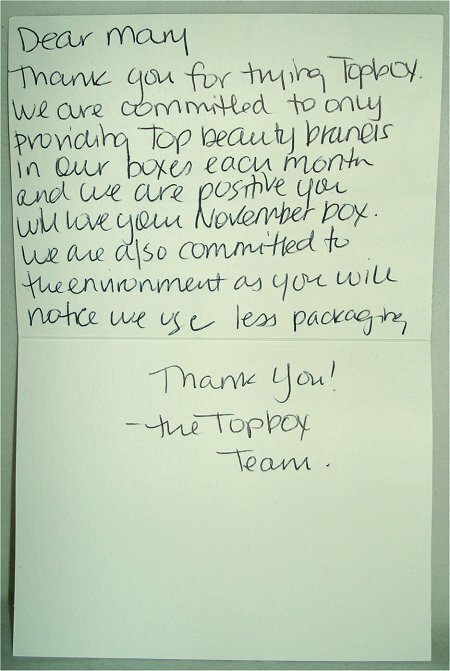 I was recently contacted by Topbox and asked if I would like to try out their November box. They also generously offered to provide the prize for this giveaway! What is Topbox? It’s like the Canadian version of Birchbox (similar to the Loose Button Luxe Box that I previously blogged about). I was really excited to see it in person, and as I was opening the package for the first time, I was taking photos. At one point, I had to put my camera down because I was so ecstatic and couldn’t believe my eyes! 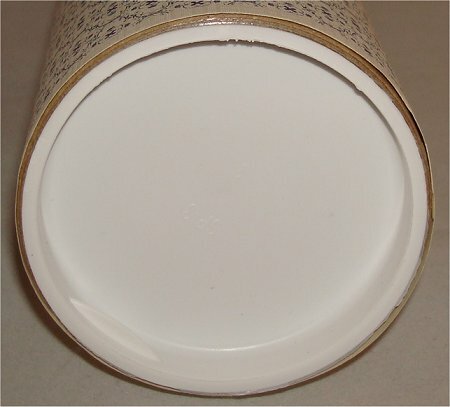 The ‘box’ was actually a cylindrical tube that was covered with a piece of paper with an elegant print. The end has a plastic lid that can be pulled off, but also reused. 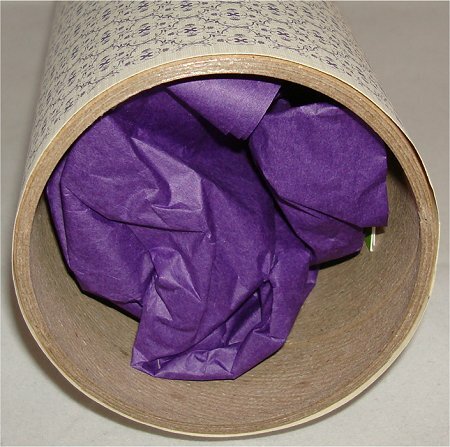 Purple tissue paper conceals the goodies inside. 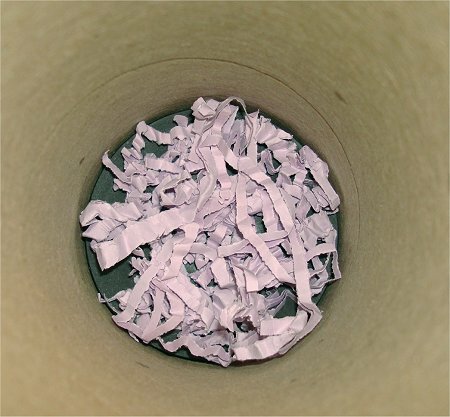 Bottom of the tube had accordion-cut purple strips of paper. Thought this was a cool shot – like going down the rabbit’s hole in Alice in Wonderland. 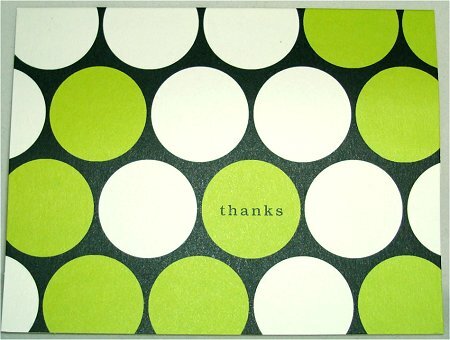 I received a thank-you card! Shows all the products in the November Topbox. YES, two items are FULL-SIZE products! I was shocked! Also, did you notice that they spelled it as “Lippman” instead of “Lippmann”? Cake It’s a Slice Velveteen Hand Creme (100 mL / 3.4 fl. oz.) – This is actually the full-size product! I was surprised! Edit: I tried it out. Click here to see my Cake It’s a Slice Velveteen Hand Creme Review & Pictures! Deborah Lippmann Some Enchanted Evening (15 mL / 0.5 fl. oz.) Okay, THIS was the product that excited me so much, I had to put my camera down and drool over it for a few minutes. Edit: I finally ended up wearing this polish. Click here to see my Deborah Lippmann Some Enchanted Evening Swatches & Review post! 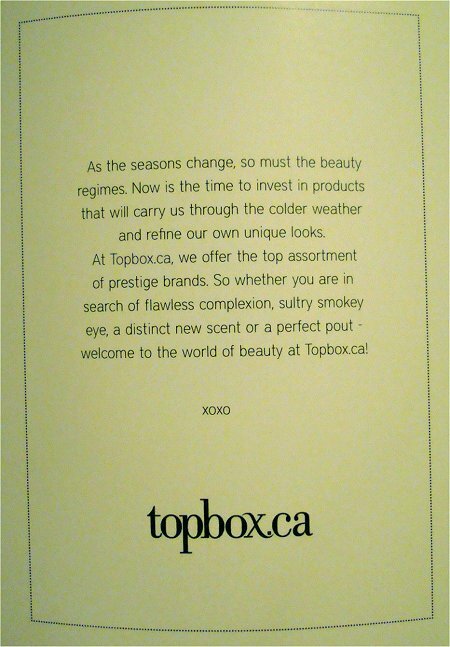 The name Topbox definitely gets the message across that they only offer premium brands. The logo uses a font that reminds me a lot of the same font used for America’s Next Top Model. Because of the name, I was literally expecting a box. When I got a tube in the mail, it was pretty cool because it’s different. The unique shape makes it stand out. Every other company sends out rectangular or square boxes, so this was something refreshing! Because the tube is reuseable, I already know what I’m going to use it for. It’s going to be my new container to hold my coins! You get 4 deluxe-sized samples normally, but in the November box, I was surprised that 2 out of 4 of them were actually full-sized products! Now, if you’ve been following Swatch And Learn, you’ll know that I’m not a fan of pink polishes. I have nothing against them, but they’re just hard for me to wear. However, since Some Enchanted Evening is a glitter polish, the layering options are limitless! 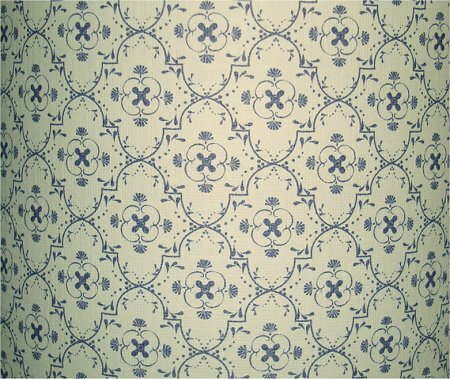 Even if it doesn’t blow my mind when worn solo, I can easily layer this over black or any other colour and use it as an accent to make it more wearable. Edit: Click here to see my Deborah Lippmann Some Enchanted Evening Swatches & Review post! Based on the package I got, I must say that I was blown away by the value. Had I paid $10 CAD for this, the nail polish itself would’ve more than paid for it all! Now, I’m not sure if they regularly include full-sized items or not, but this month was superb value! As I keep mentioning, Topbox prides itself on offering only prestigious brands. 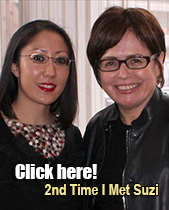 Some other brands they mention on their site include Benefit, Shu Uemura, Lise Watier, and SkinCeuticals. 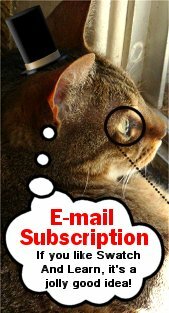 To join Topbox, it costs $10 CAD per month to subscribe. If you want to cancel, their website says you can do so at any time by e-mailing them. There are no cancellation fees. What I like about Topbox is that when they send out your package, they e-mail you with a tracking number so that you can track the package en route. You’ll have a better idea when to expect it, which I appreciate. Also, no signature is required for delivery. Overall, I really liked Topbox. While I appreciate personalization, I do like to pay more for quality-brand products. So, Topbox got a top score. The only reason I deducted a smidgeon was because of the randomness factor. You don’t know exactly what you’re getting. That’s fun, but sometimes it’s a gamble. What do you think about Topbox? Were you as blown away as I was when you saw the full-size Deborah Lippmann polish? How do you think it compares to similar companies in the market? Edit: The giveaway is now closed. I love reading comments from you, and anyone can leave a comment below, not just those entering this giveaway. If you’re Canadian and you do want to enter, though, please indicate somewhere in your comment that you would like to win a Topbox. That’s it – easy peasy! You can leave as many comments as you want, but I will only put in one entry per person to make it fair for all. I’ll use random.org to select a winner sometime on Monday November 21. I’ll e-mail the winner, and from the time I send my e-mail, the person has 72 hours to reply to me. If I don’t receive a reply, I’ll have to choose another winner, but I really don’t want to do that. When the winner replies, I’ll forward your name and e-mail address to Topbox. At that point, they’ll send you a promo code to use on their website to redeem your free Topbox! I’ll announce the winner on this post (in this section), on Twitter, and on Google+! Edit: Congratuations, Lindsday! You’ve won the giveaway! I e-mailed you at 2:22 pm on Monday November 21st. Please reply to the e-mail within 72 hours to claim your prize. This entry was posted in Blog News, Giveaways, Product Reviews and tagged Cake Beauty, Deborah Lippmann, Dr. Brandt, Stila, Topbox on November 16, 2011 by Mary S..
I’m not sure if all their ‘boxes’ come in cylinders, but I hope so! Cool shape. You’re now entered in the giveaway. Good luck! Yes, they definitely live up to their claim of containing only top products. Good luck in the draw! Yeah being Canadian! LOL! I would LOVE to win a Topbox, what a cool idea 🙂 Thanks for the giveaway! Wow, I can’t believe they gave a full sized DL polish! Her polish is so pretty but like you said pricey. 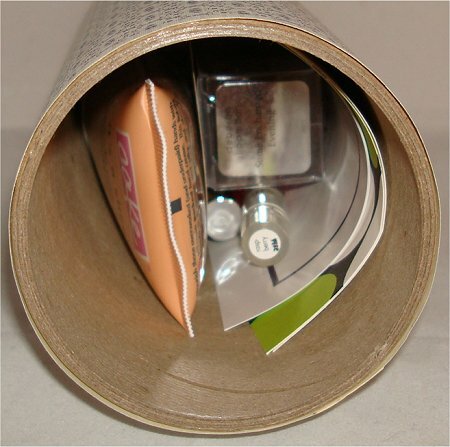 I love the packaging- the pretty tube & personalized card is a nice touch. I know, right? That was just craziness! If I didn’t put my camera down when I saw that, I might’ve dropped it. Seriously! Oh, I didn’t know that they sold out of the December and January box! Well, that’s good news for them – sounds like business is doing extremely well, and for good reason! I would like to win a topbox! I am newly subscribed to both Luxe and Glymm…this new service really has my interest!!! Great review by the way–looks like delish goodies!!! Wow, Luxe and Glymm? That’s awesome! Wow!! I would LOVE the win a topbox!! Yeah, I was blown away by the products I received. Great value! Does it? I haven’t looked into Glymm at all, so I’m clueless. I was excited about the hand creme – always saw it at Sephora, but never tried it. I think the price was what always scared me away…hehe! I’ve entered you in the draw. GOOD LUCK! You’re very welcome! I really enjoy reviewing products and sharing my thoughts on them with you. 🙂 I like to help people make informed decisions before they plunk down their hard-earned money. This box is pretty impressive, compared to the teeny sizes and the less-known brands I’ve seen in Loose Button and Glymm boxes. Hopefully every month you’ll get at least one full-size item, which makes the box pay for itself. I would love to win a Topbox, because I like getting presents in the mail! That would be so awesome if every month’s box has at least one full-size item, but if they did that, haha, I don’t know how they’d stay in business. I think they might add the occasional full-size product, but maybe not every month. But, boy, if they do, AWESOME! I was too excited to try that hand creme. So far, I really like it, but I’ll need to try it out for longer to get a better feel for it. I’ll definitely be reviewing it. 🙂 Yay, my first cake product! I’d love to sign up but it seems like this is only in CA? Do you know if they have this for the US? 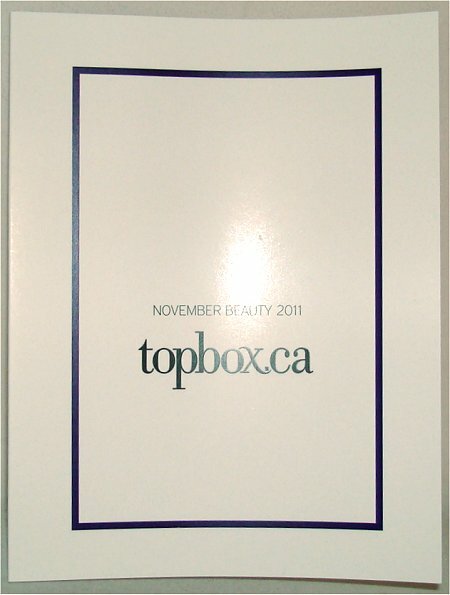 Yes, unfortunately Topbox only ships to Canadians. They’re a Canadian company. But if you’re looking for a service that’s like this in the US, try Birchbox. 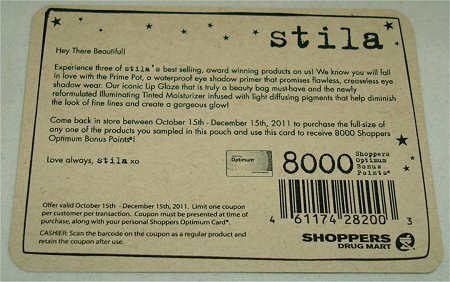 Hehe, yeah, that 8000 bonus points coupon is a great incentive to buy that Stila gloss. ah, omg i never even thought that they’d have something like this for us Canadians! I’m always so sad when things are US exclusive 🙁 so thanks for sharing! You’re entered in the draw. Good luck! OMG, seriously? A Deborah Lippman polish? That’s freaking amazing. Can’t wait to see swatches of that one. And I am such a huge fan of Stila’s glosses. They last foreeeeer. YEAH! I couldn’t believe my eyes. When I first opened up the tube and saw the Deborah Lippmann box, I only saw the top of it – the part with the sticker. I was freaking out and thought that maybe it was something like cuticle oil, but then when I pulled out the box, NO WAYYYY! And I’m treasuring it even more because this is only my 2nd Deborah Lippmann polish ever! Aww…sometimes I feel guilty about enabling people. I hope that your finances are alright. Maybe go easier after the holidays? But, yeah, I know how you feel after seeing that polish – it’s a great incentive! Hi, I am new to the blog and YES I want to win this box!!! I’ve entered you into this giveaway. Good luck in the draw! I WOULD LOVE TO WIN THE TOPBOX!! rae recently posted: Daily Nail: Hello, Kitty! Before Topbox contacted me, I had never heard of them, either! And I don’t know how that was possible because my first experience blew me away. Really surprised that there isn’t more hype about this company. WOW, you’ve been getting Glymm and Luxe Box? LUCKY! Good luck in the draw, rae! 🙂 Fingers, eyes, and toes crossed! Hehe! This looks so much better than Birch Box! I wish I could get it in the US! Is it? Hehe, I always see Birch Box unboxings on YouTube and think it’s pretty cool. Aww…I wish you could enter, too. But don’t worry – I’m going to try really hard in my next giveaway to include more people. This time and the previous time was for Canadians only just because I feel like oftentimes we miss out on a lot of cool stuff simply because a lot of companies/bloggers won’t ship to Canada. Yes, I applaud their environmentally friendly stance. I think it’s quite smart because then they can pay more attention to spending their money on the actual products instead of the packaging. I’m Canadian and would like to win the topbox. Oooh, I’d love to win a topbox please! I want to try them out, maybe I’ll subscribe! 🙂 this review was very helpful. You covered all the questions I had and I love the detailed pictures. Thanks so much for being so thorough. I think this company looks awesome! I’ve entered you in the draw. Best of luck! Pictures of the November Topbox started popping up yesterday, and boy was I envious! I have received Glymm and Loose Button boxes, and none have been as fabulous as this. This is the best box I’ve seen! That’s actually really nice of you to bow out even though you could’ve totally entered. Hehe, imagine if you won BOTH? Oh my – everyone would be jealous…even me! Hehehe! Thanks, though, for still wanting to leave a comment on this post. I love reading and replying to comments! Glad that you think Topbox IS the top. Hehehe…(Corny joke)! The nail polish is simply amazing, that just convinced me to sign up, actually. I’m a Canadian and would like to enter. I actually just ordered my first topbox the other day but since December’s box is sold out I will be waiting for January. Also… I just wanted to let you know that I saw the Kardashian OPI collection at Shopper’s today. The display only had a few colours so maybe SDM is only having half the collection. Not sure of the whole thing but regardless I wanted to let you know I saw them there just this afternoon. Hope this helps! Canadian girl! Enter me in the contest! I can’t believe I’ve never heard of Topbox before! I’m going to check out the website right now! Great share! Yeah, I couldn’t believe I didn’t hear about them before, either! They’re sold out of January already!! OMG our very own Canadian Birchbox!!! How awesome is that??? I would LOVE to win the December topbox! You’re very welcome. I was so excited to be able to offer something this cool to my Canadian readers! You’re entered in the draw. Best of luck! I’d love to win me some Topbox stuff! 🙂 Since their December box is sold out, I’d like to try it this way before signing for January one! I would LOVE LOVE LOVE to win a Topbox! Yeah, me neither! For a nailphile like myself, I was in awe! Glad to hear that you enjoyed Swatch And Learn so much that you bookmarked it. 🙂 I update it daily, so please do come back and check it out. I have lots of reviews, swatches, tutorials, and more to share. Wow, lucky you that you’re already getting Glymm and Luxe Box! Are you going to have a review and swatches for your new DL? One day you’ll also get your first Deborah Lippmann polish, and when you do, you’ll be bouncing off the walls like me! 😉 And, yes, when I wear it, I plan on sharing it with you all in a blog post! Glad you enjoyed my little review on the Topbox. Good luck! 🙂 You’re entered in the giveaway. Oh my! Thank you for this giveaway! Hooray for Canadians! 😀 I would love to win because all of the products look great! I think I would be as happy if I only got the nail polish. I’ve always wanted to try out Deborah Lippman but I thought it was just too expensive… Great pictures by the way, very detailed! Thank you! Jennifer recently posted: Lusting… for makeup! You’re so welcome, and also thanks to Topbox for being so generous! 😀 It’s about time us Canadians had something really cool like this. The giveaway is actually for the December Topbox, so what I showed in my November Topbox is different than the products you’ll get in December’s. But I’m willing to bet that the Topbox team will include some pretty awesome products in December’s! You’re entered in the giveaway. GOOD LUCK! Thank you – glad my review was so convincing. I’m really impressed with Topbox, as you can tell! i would love to win a top box! ive always wanted a glymm box or luxebox but ive been a little iffy about it because i dont know if i would use all of the products i get. I’ve put your name in the giveaway. Best of luck! Sorry that you were disappointed by Gylmm. I’ve never tried that out yet. Maybe your first box was just a fluke and the ones after were better? I never knew stila and cake were considered “premium brands”. To me, I think of Dior, Lancome, Guerlain..etc. 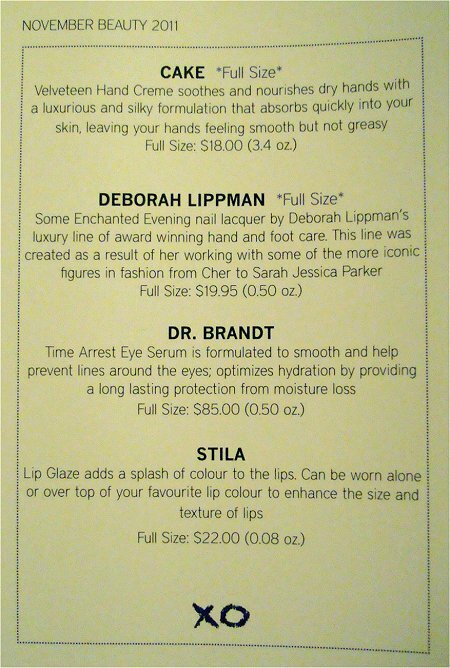 Hmmm, but it’s awesome to see that deborah lippmann was included! Now that’s nice! I love the packaging too. It has the cutest pattern, and the tube would be perfect for storing stuff like make up brushes! Yeah, the Deborah Lippmann polish was like the icing on the cake for sure! 😀 It was a crazy surprise! I’ve added your name in the giveaway. Good luck! Wow, Mary, you just threw me a curve ball! 🙂 Just when I had decided on the Glymm box I see this… I would definitely loooove to win a Topbox! Hehe, if I threw you a curve ball, then consider Topbox a pitcher because they threw a strike! 😀 Talk about hitting “Amazing” right on target. I’ve entered your name in the draw. GOOD LUCK! Hey Mary, I would love to win a topbox. Your name’s now in the giveaway. Best of luck! I would love to win a top box. Good luck – I put your name in the draw. I was linked to your blog by Topbox on Twitter and I LOVE your review! I’m so obsessed with these monthly subscriptions (I subscribed to both Luxe Box by LooseButton and Glymm box) and after seeing the products your got from Topbox I really think that these boxes are better than Birch Box. A Deborah Lippmann nail polish? Are you kidding me? Usually when I get an Essie or China Glaze nail polish in a box I’m already pretty happy, Topbox really spoils their subscribers! Omg I would love to win a Topbox! Thank you for doing this review! WOW – thank you very much! 🙂 Glad that you found my review helpful. Hehe, yeah, a Deborah Lippmann polish! I KNOW! I appreciate how Topbox spoils their subscribers like that – it’s definitely a good way to grow their fan base, too. Well played indeed! I’ve put your name in the giveaway. Good luck in the draw! I would love to win a topbox! I’m so glad you did a review on this, I was looking into all the different ones and thinking of subscribing to one! Definitely considering subscribing to top box. As if there were full sized products in there, very impressed!! You’re welcome – I was more than happy to try it out for myself, and I didn’t expect to be as impressed with it as I was! Those full-size products were insane! Yeah, they’re doing pretty well! If you want to enter my giveaway for the December box (it’s been reserved for the lucky winner), please let me know, and I’ll add your name in the draw. Love the review of TopBox and oh yes, I would love to have one of my own. The are sold out until February! Haha, who’s Christine? I’m Mary. Now that we got that clear, I’ve entered you in the Topbox giveaway. Good luck! Oooooooooooooh!!! What an awesome find!! I subscribe to LuxeBox but like the contents of Top Box much better! I would love to try out this company. I was really excited to find out about Topbox. 🙂 Glad to share my experience with you all. Your name’s in the draw now. Good luck! It’s about time we got something really cool! I’ve entered your name in the giveaway. Good luck in the draw! I am loving this TOP BOX giveaway. Such a great idea…and who doesnt love getting mail and great products to boot!! This box sounds amazing! I’m a member of Luxebox, but as of late, I’m not too impressed with it. I guess we need o put our order in now to hopefully receive Top Box sometime in the new year! I’d love to win this Dec box!! And I am Canadian!! Aww…sorry that you’ve been let down before. Sometimes it’s a bit of a gamble as to what you get. Hopefully you’ll like Topbox, though. I’ve entered your name in the draw. Best of luck to you! I’d love to win! I’m Canadian too- so sad all the boxes are sold till feb.
You’re entered. Good luck in the giveaway! Yeah, crazy, isn’t it? But that just goes to show you that people love their service! Thank you for reviewing this box! I just heard about Top Box today and ordered a subscription…the Nov box looks so fab, I love Cake Beauty!!! I didn’t see you mention in your comment that you’d like to win a Topbox, so if you do, please reply to this comment to be entered. I’d love to win a topbox! I’ve tried both luxebox and glymm and found theirs lukewarm, but these look great! Aww…sorry that you thought theirs was just so-so. I was pretty happy with my October Luxe Box. Topbox, however, really did blow me away with their November box! Good luck! 😀 You’re entered in the draw! You hate Luxe Box’s packaging? Really? I only got their October box, which is the sleek new black design, and I was highly impressed. It looks really chic, and I’m going to reuse it somehow because it’s really pretty. You’re very welcome! I’ve entered your name in the draw. Best of luck! I would LOVE to win a TopBox!! Seems like they are setting the bar pretty high for the other two Canadian sample companies. A full size DL np wow thats sweet! I put your name in. Good luck in the draw! Just found you on the Shabby Apple “deck the halls” pintrest site! I love makeup and have really enjoyed browzing your blog. It would be great if you could count me in to the topbox give away. Sure! I’ve put your name in. Best of luck! I would love to win the December Topbox! Sad for us, yes, but good for them! Looks like there’s a lot of interest in their service. I’ve been wishing that we Canadians could have birchbox, so I’m so happy that there’s something similar! I can’t believe you got a full sized Deborah Lippmann polish, that’s so amazing! I’ve been reading Swatch and Learn for a while, but this is my first time leaving a comment. Love your reviews so much! Good luck in the giveaway! I put your name in the draw. I would love to be entered to win a TopBox! I put your name in the draw. GOOD LUCK! I would love to win a Topbox. I jut found out about the company and am disappointed that they are sold out up until February. Aww…well, they’ll probably take into consideration all the demand so that future months they have enough supplies. I have been so disappointed with the samples I’ve received from Luxebox and Glymmbox. This finally looks like a winner! Sorry to hear that you’ve been disappointed by others. I tried out the October Luxe Box and was quite impressed! But it’s all personal – a product that one person uses may be useless to another. I’d LOVE to be part of the giveaway! Yeah, but if you win this box, you’ll get the December one! Aww…I know. A lot of people have been disappointed, but at least you have a shot at getting the December box in this giveaway! Yes, I did – very crazy, but good that their business is booming. I am drooling! The DL polish is so gorgeous. I can’t believe the *cylinder* is only $11.30. And I thought that the Loose Button Luxe Box was a great deal! I love that the Topbox is environmentally friendly. The Loose Button Luxe Box had so much packaging. I’d love to get the chance to win a box :] Even if I don’t win, I’m probably going to sign up for the box. It’s a steal! Good luck in this giveaway! I would love to win a TopBox! It looks like the best of the bunch – not really taken with the others, but this looks like nice brands, cute, smart packaging and good customer service – thanks for the review and for the contest! Good luck! I’ve entered your name in the draw. Wow, you’ve seen boxes that retail for $40? Yeah, that’s too expensive for samples. The price is right with Topbox. I’m SO GLAD to hear that you love Swatch And Learn! 😀 And I appreciate that you’ve been reading for a while. Hope you continue to stick around and leave comments occasionally. 🙂 I love interacting with my readers! You’re entered in the draw. Best of luck to you! oh id love to win a topbox 😀 thank you! You’re welcome. Good luck in the draw! I would **love** to win a topbox! i’m so jealous of the nail polish! I would live to be entered to win the Topbox! I cannot believe they put a full sized Deborah Lippmann nail polish *die*. I have a few and I just love them, but they’re so pricey. Me neither. If I didn’t put my camera down when I saw the polish, I probably would’ve dropped my camera! It was so shocking to see it! You’re entered in the giveaway. Good luck to you! Okay… so my comment is #149!!!! I’ve waited in line just to say! 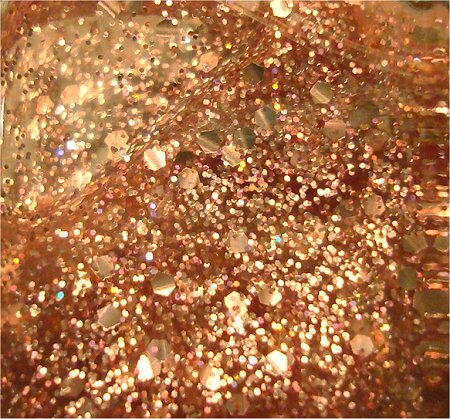 OMG Deborah Lippman pretty glitters! There’s a so many untried polishes on my list – ahhhhh! Hehe, but the Deborah Lippmann one nears to go near the top of that list. Wow, the products look fab! Love that nail colour. Please enter me for the giveaway! THAT DL nail polish is sooo pretty I’ve always been eyeing that color in stores! The I love cake prducts..they smell heavenly. I’m really considering getting this! I’m obsessed with these makeup subscription boxes (already on luxe box and glymm >. I’ve put your name in. Good luck! Awesome that you’ve got Luxe Box and Glymm! 🙂 I only recently signed up for Luxe Box and Topbox after I tried a box of theirs first. Loved seeing what you got in your topbox and would love to win one as they are now sold out until March! I have been subscribing to Luxe Box and Glymm for the past three months and just cancelled my Luxe box. I always seem to be disappointed with it compared to Glymm and now it looks loike Top Box could move to being my first choice. Oh wow, sold out until March now? Seriously? I’m so glad that I got in my order for the February box just on Friday then! You cancelled your Luxe Box and I just placed mine. 🙂 I’m excited to see what’s in the December Luxe Box because I liked the October one that I got to try. Thanks Mary. Hopefully you will enjoy your Luxe box. If it were the only game in town, I would have kept it because I love the surprise factor and trying out new things but the products I have seen from topbox and the ones I have received from Glymm are just more to my liking. Hope I do, too. I’ll blog about the December Luxe Box most likely. Would love to win this! I am in need of a December treat! I’ve put your name in the draw. Best of luck! I would love to win this!!! Dying over that nailpolish! You’re entered. 🙂 Good luck! You’re welcome! I was happy to share it with you. I entered you in the draw. Good luck! I would like to win a Topbox! I’ve never heard of them before so I will be checking out their website, the products they represent are great! Thanks for all your swatches; I just discovered your site a couple weeks ago and have been busy reading it all! I’m so pleased that you’ve been enjoying my blog so much! 😀 Thank you for letting me know that you appreciate my hard work. It means a lot to me. I put your name in the draw. Best of luck! Whoa, if this is a typical box, I will definitely have to look into signing up. Until then I would love to enter to win one. I’ve put your name in the giveaway. I’ll be choosing the winner today. 🙂 Good luck! Hi, I was just wondering what I will need to purchase this. Will i need to use my credit card or can I use paypal? When I signed up, they took credit cards. Stumbled across your site and this review while looking for thoughts on TopBox. I just got a Subscription Offer and this review / items pictured in the box made me decide to go for it! Thanks for stopping by and for leaving me a comment! I hope that you enjoy your TopBox subscription. Please let me know what you think of the products you receive!